Will Novell Apologise or Will Novell Conceal? It’s midnight here in the United Kingdom, so it is officially the Wednesday when Novell is expected to deliver its big report. When Novell reports results on Wednesday afternoon, watch for $0.04 EPS. NOVL’s PowerRating (for Traders) is 4. 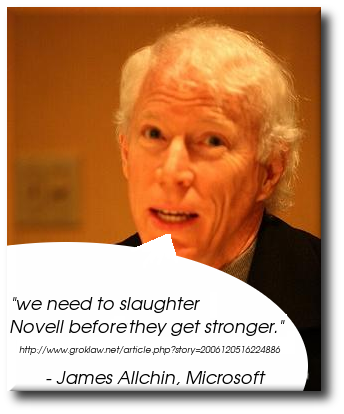 As pointed out yesterday, Novell is likely to hide the true unhealthy state of its business. There are a variety of methods for concealing losses or diverting an investor’s attention. Former Novell employee, Matt Asay, made some observations just hours ago. They may be good changes, but word on the street is that Novell is laying people off and reorganizing its operations, apparently quite extensively (the reorg, that is, not the layoffs). A source close to the company has suggested that Novell is trying to change its model again (perhaps indicated by the news that it is overhauling its channel program), and that some very good people have been let go. Let’s wait and see how things turn out. The rumours were never encouraging and there’s news about another large customer that Novell lost to Microsoft. The DHB has already announced it will dump its current Novell Netware and GroupWise authentication, email, calendaring, scheduling, task management and personal address books in favour of Microsoft Exchange and Outlook. It’s getting laughable. Are you seriously suggesting that Novell, in publishing it’s financial results, is going to lie to the world? Or are you just a WUM? What is the point of your website? You undermine yourself by writing rubbish. If you want to persuade people to boycott Novell because they are the great Satan, or have done such harm to the world, then let’s hear reasoned argument, and logic, and some facts might be nice. You clearly have no idea what you’re talking about… not a clue. Novell is also good at PR. It has been talking about desktop Linux being just around the corner for years, without delivering anything worthwhile. No wonder I get such a hit to the numbers here for mentioning Ubuntu. This continuing game of massaging numbers and expectations, rather than delivering solid performance or solid software, hurts the whole open source market. Having covered Novell for two decades, I’m frankly tired of it. Wall Street, not so much. As long as there is action Wall Street is happy. I find it curious that you show up when Novell’s financial affairs are discussed. Where are you the rest of the time? I wouldn’t point to that blog post as evidence. It was idiotic when it was written, and it hasn’t changed. This isn’t a defense of Novell. It’s a devaluation of that blog post. I agree, Ian. It’s not reliable enough to be used as strong evidence, but at least it’s something.